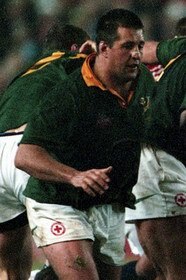 Dawie Theron began his senior rugby career with Free State before enlisting at Griqualand West in 1995. He has represented SA Universities, the SA Defence Forces and the South African Barbarians and made his Test debut in Bloemfontein against Australia in 1996. He played in all five Tests on the tour of Argentina, France and Wales last year and gave a powerhouse display in the third Test against the British Lions in the past summer. He is a keen fisherman and is employed as an agricultural advisor for Standard Bank, one of South Africa's largest banking corporations.